(posted June 30, 2012) Last week more than 30 translators gathered for four days in the church hall of the Kepinle church on Pohnpei to begin translating the Bible into the languages of Mwoakilloa and Pingelap. 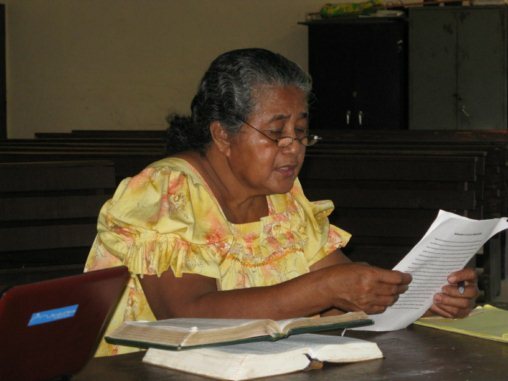 By the end of the four day workshop both groups had completed almost 200 verses of the Bible; these verses are the daily Scripture readings for the month of July, taken from their church selection of Bible readings. 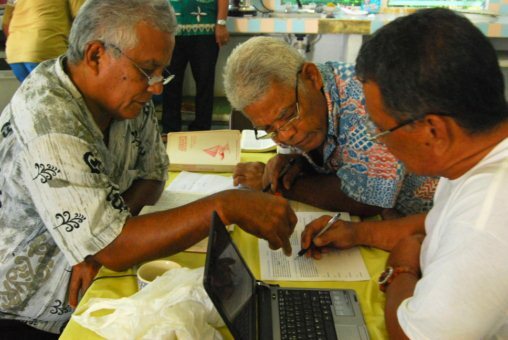 The translators learned the basic principles of Bible translation, using the closely related Pohnpeian language Bible as their main source text. They then practiced reviewing each other’s work. 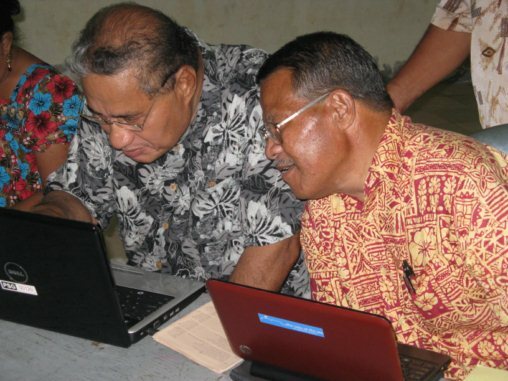 Many of them have their own laptops, so the translation program Paratext was installed on about two dozen computers. Isles of the Sea staff members Nico Daams, Peter Knapp and Ken Dixon were kept very busy, guiding the translators through all these unfamiliar exercises, and were amazed at the enthusiasm of the translators, the long hours they worked, and the community support behind the scenes. When one of the projects needed some extra typing done, two young students came in to help out. A seemingly non-stop supply of meals and snacks kept coming throughout the four days of the workshop, from each of the four churches where the Pingelapese and the Mwoakilloa people worship. A few of them, including their high chief Solomon, commented on the fact that this was the first time in their history that they worked together on one project. 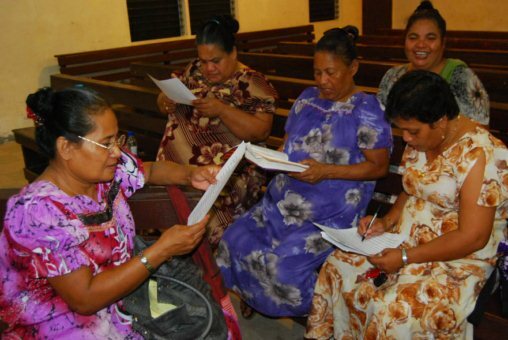 At the end of the meetings each group had a planning session; the assignments for the coming months were made, and officers were appointed to oversee the work in each of the six churches, including the home churches on Pingelap and Mwoakilloa. Dais Lorrin was appointed as the project coordinator for the Mwoakilloa project, while the Pingelap group appointed Ken Dixon and Pastor Saladier Ilai as the coordinating team. Ken and Ruth Dixon have only recently joined the Isles of the Sea team, with their main assignment as lecturers at the Pacific Islands University; but they are excited to be involved in the Pingelapese translation project and to see the commitment of the people to their translation project.